Hello! It's time once again for a new sketch from Freshly Made Sketches! Here we are in December and the final countdown to Christmas! At this point I am definitely pretty much done with my holiday crafting - cards all made (and most are even addressed and ready to mail too! Woo hoo me! ), my craft fair projects are all done, packed up and ready for the fair tomorrow, and most presents have been made/bought/mailed. We still don't have lights up or a Christmas tree yet, but hopefully that will all be done by the weekend. Last week I got my Valentine's Day release order from A Muse Studio and I could not wait to dig into it. So many fun new products to play with. And Cindy Hall's fun sketch this week was just perfect for what I wanted to do. And here is the fun sketch from Cindy for this week! I love pink and black together! This is so sweet! Fantastic sequins and such a perfect embellishment for "hubba hubba!"" Oh now this is fun and what a great sentiment! You are way too organized for me! It certainly sounds like you are all set for Christmas! In fact, you are so "set" that you had time to make a Valentine! I'm so envious!! I love the off-set heart and the sequins are so pretty! 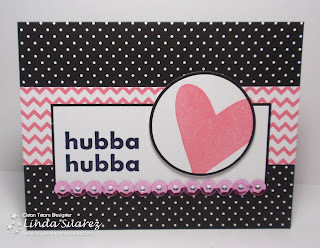 Oh, I love that sentiment ... and love your Valentine card! Such a refreshing change from Chrissy cards! I am still going with my Christmas cards, a few more to go .... yep, I'll be pushing it right up to the 11th hour!!! Oh my gosh, this is such a cool card! Love the colors and the sequins are awesome! That stamp set is the best! I envy you your readiness for Christmas!! But what a fresh thing to see! Love this fun sentiment! 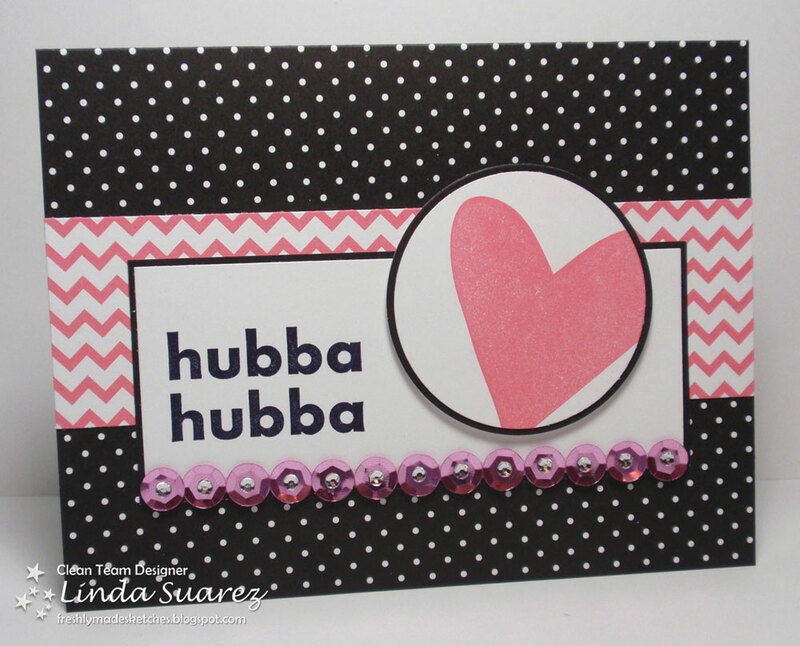 Another fabulous card!